My Nov 6 ballot is in (we vote by mail in Washington State – no waiting in hours-long lines). I voted ‘Yes’ for initiative I-1631 that proposes a carbon emissions fee. Starting in 2020, it would impose a $15 fee on large emitters of carbon, based on the carbon content of fossil fuels sold or used in the State, and electricity generated in, or imported, for use in the state. The fee will increase by $2 increase each year until at least 2035. Yes, it will raise gas prices and make homes more expensive to heat, and increase transportation costs. But at some point, someone needs to point the way to start to save what clean air we have left on the planet, and get serious about promoting clean energy. As for every one the Republican candidates on my ballot: forget about it. Your party is grotesquely anti-democratic, and a lying, cheating, immoral scam of an outfit. 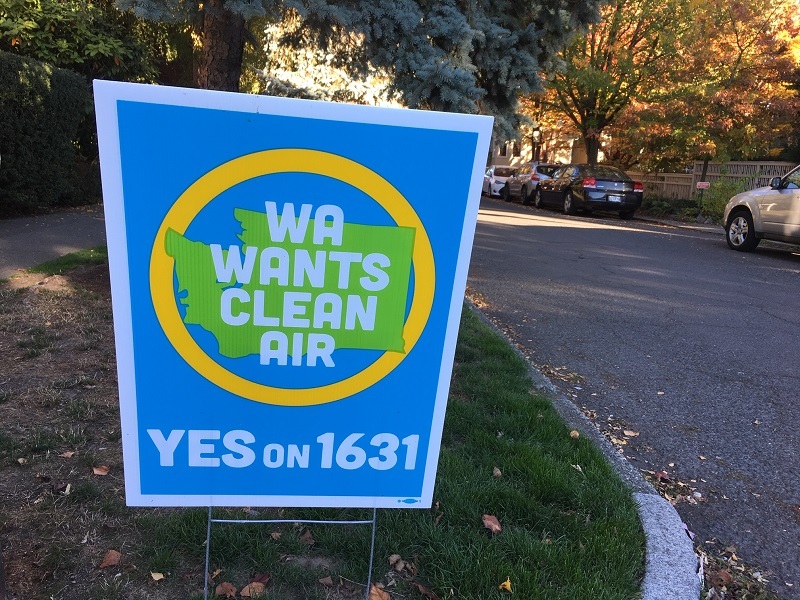 A sign here in my neighborhood in support of I-1631. It is the most expensive ballot initiative in Washington State’s history, because it threatens Big Oil’s Earth-destroying profit model. They have poured in $26 million to fight I-1631.